The blue, red, and yellow match my kitchen. The green is just for fun. Gene is in a corner of my breakfast nook so you can see the colors I was drawing from when I picked the fabrics for my apron. She’s also wearing two other garments I made. Honestly, it could have been done in one day, but I cut it out one day, did half the sewing the second day, then did the final sewing on the third day. What a nice, leisurely sewing pace. And now I have a pretty new apron. And since I plan to use it, I’m sure it will be stained in no time. The pattern has an unusual (for the modern day) construction technique. 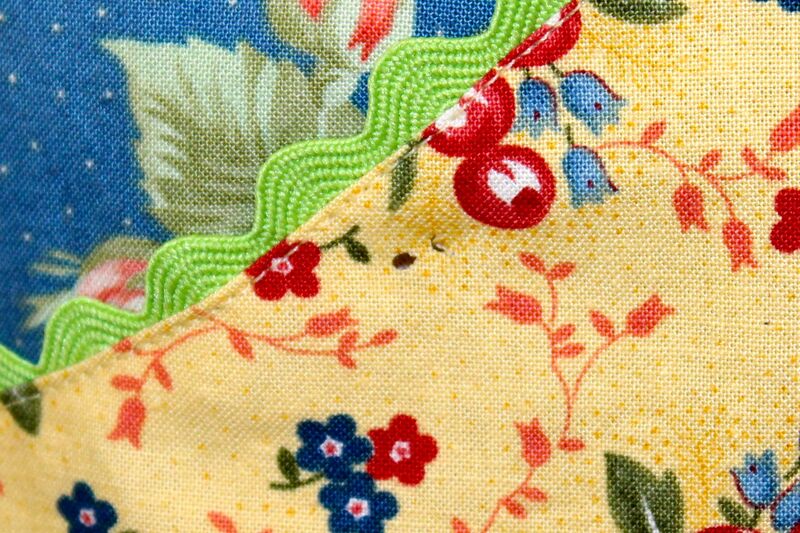 The seam lines for the scalloped fabric trim on the bottom of the skirt and the side parts of the pocket were stay-stitched. Then they were turned back, pressed, lapped on top of the main fabric, and edge-stitched down. It was rather like a giant applique. While I haven’t made a piece of clothing with this technique, I have seen vintage reproduction pattern instructions that call for it along curves. Pressing the seam allowances back was pretty tricky with an iron blasting full steam. I really need to get some ironing gloves before I burn myself. See the round hole and the little crescent shaped one next to it? Well, crap. I didn’t spend too much time crying over it. It is an apron, after all. I just got out my Fray Check and treated both sides of the holes. That’s right. The main floral is UPSIDE-DOWN! Before cutting out the fabric, I quickly scanned it and noted that the blossoms were facing all directions, so I ASSUMED my floral was nondirectional. 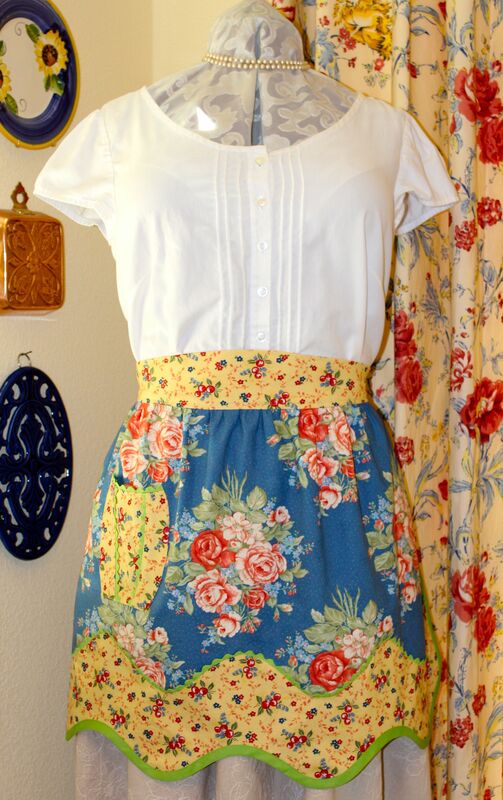 Until I had already cut everything out and was placing the finished pocket on the skirt. That’s when I was annoyed to discover the little grouping of stem ends facing up. UP? What?! 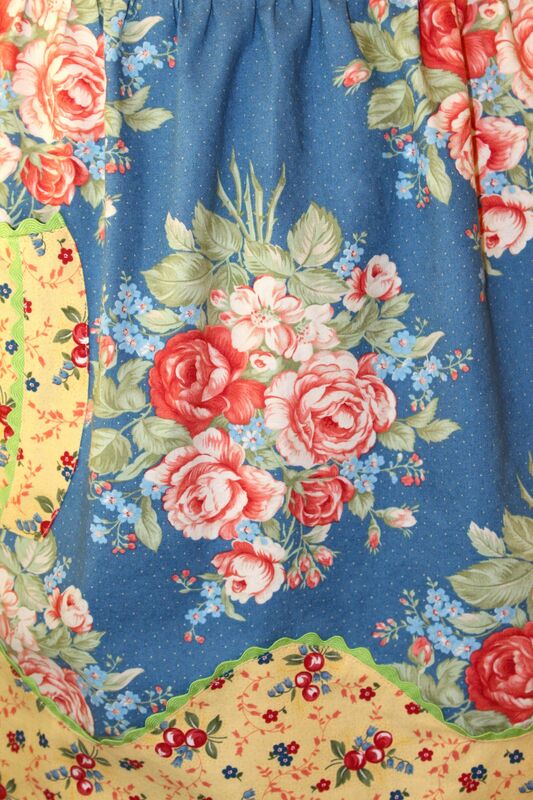 I expect this in a home dec fabric, but why would anyone design a quilting cotton floral that’s (just barely) directional? Grrr. Truth be told, the upside-down bouquets are more annoying to me than the little holes courtesy of my pinking shears. Despite the flaws, so cute! 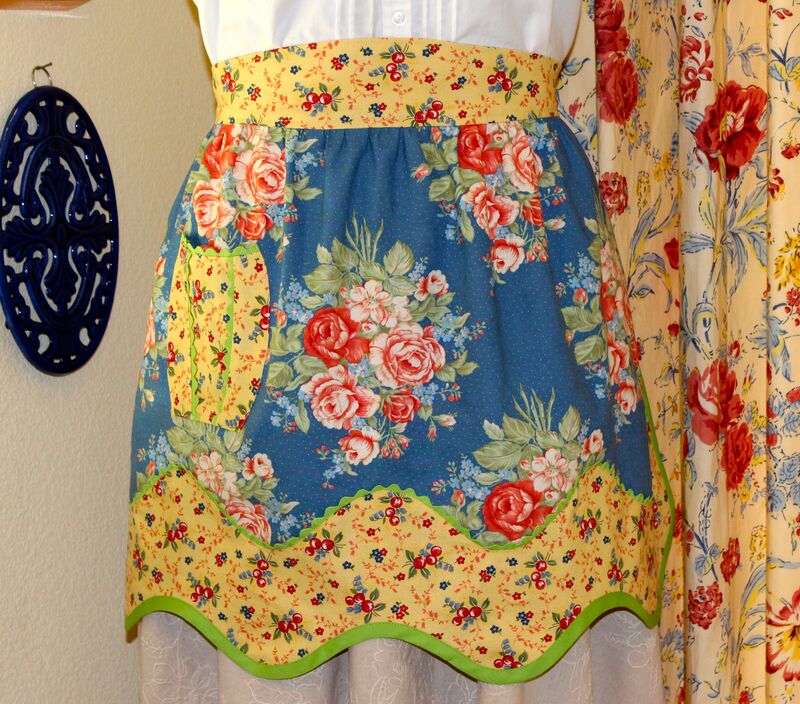 I like having a fancy apron so much that I’m intending to make another one from a different vintage-style pattern in my stash. 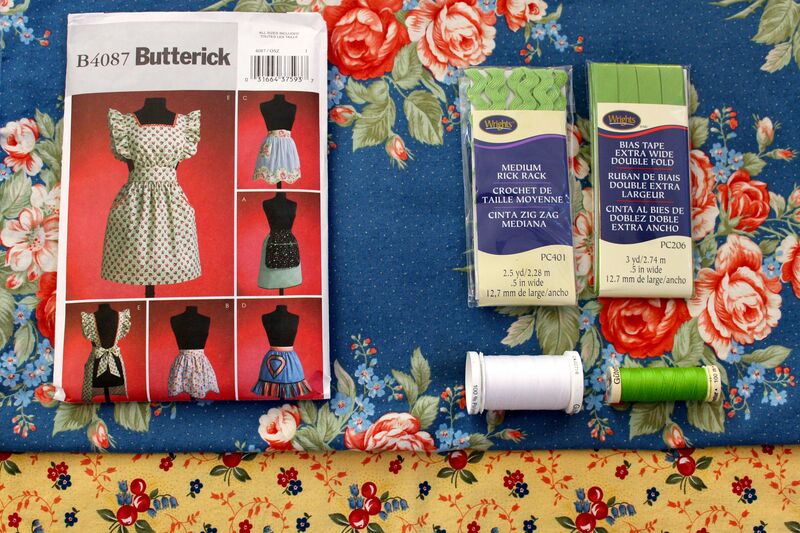 I already purchased a darling reproduction 1930s quilting fabric from Country Sewing Center, the really nice quilt store here in town, but I still need to buy bias tape. The pattern calls for making 7 yards of 1/4-inch bias tape from scratch, but I don’t want to get that up close and personal with my steam iron. Plus, that seems really narrow. So, I’m taking the lazy route and buying regular double-fold bias tape. That project will be up next. No biggie, its an apron after all. Wear it every day.